Caricatures of the Chinese real estate market fall into two camps: bears view it as a remarkable bubble that is going to burst, while bulls believe that it is part of an economic engine that has every reason to keep humming along. Bears talk about ghost cities and empty apartment complexes and costs well beyond standard income:price ratios. Bulls talk about hundreds of millions of people still in the countryside, the low quality of the existing housing stock, and the government’s desire to avoid a calamitous drop in prices. The Economist’s recent special report (which I wrote about here) on China’s urbanization touches on these debates. Suzhou, about an hour’s drive west of Shanghai, is suffering from oversupply in office buildings, especially in the Suzhou Industrial Park, said the report. How can there be any confidence that either (1) prices won’t collapse or (2) the units will remain empty? The answer is that policies–particularly related to China’s hukou (household registration) system–place significant restrictions and limits on the property market, and the prices reflect a belief in the level of demand in the absence of these limits. Restrictions still exist that make it difficult for rural born Chinese to permanently relocate to urban environments and enjoy the social service benefits of cities. Those interested in purchasing multiple units face difficulties. Shh! 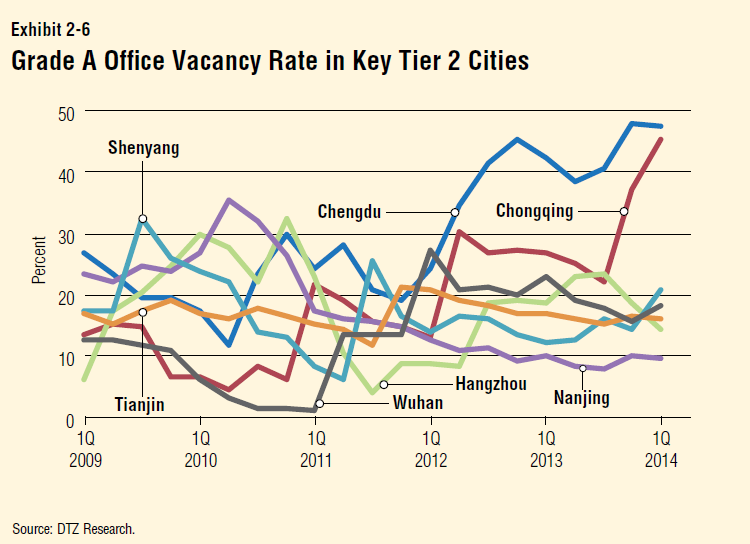 As the country’s property market starts to deflate, China’s cities may be relaxing their property curbs. But it doesn’t mean they want too many people to know about it. The latest example comes from the northeast city of Shenyang, where the glare of media attention after it was reported that the government was easing property curbs prompted some real estate types to dive for cover. Larger Chinese cities like Shenyang are relaxing their property policies, but want to do so quietly. Officials are loath to publicize their efforts to ease curbs for fear it would seem a tacit acknowledgement that the local economy has hit the rocks. China has managed its urbanization, spreading development around the country in order to maintain economic and especially political stability. My new book, Cities and Stability, shows how and why these actions worked. Moving forward, however, there are real questions. The CCP leadership continues to be interested in encouraging the development of smaller cities with policy preferences and restrictions, but as the real estate sector grows in size and importance, individuals and corporations are placing billion dollar bets about the nature of these distortions and future policy changes. The property sector could absolutely slow down or indeed reverse China’s rapid GDP growth, the bedrock of economic and political confidence in the country. Biasing policies towards those born in cities while keeping out or discriminating against those born in the countryside has been a successful set of policies for the Chinese leadership for decades. Today, it encourages excess development in both lower and top tier cities. Lower tier cities focus on their recent rapid growth and upward trajectories–that are the result of policy favoritism–in attracting future investment based on extrapolation. Higher tier cities point to the restrictions that have limited growth in the recent past and encourage developers and investors to consider what would happen if the shackles came off. Alliance Formation in Civil Wars. By Christia, Fotini. Hunger in the Balance: The New Politics of International Food Aid. By Clapp, Jennifer. Collective Killings in Rural China during the Cultural Revolution. By Su Yang. Reconstructing the Cold War: The Early Years, 1945–1958. By Hopf, Ted. Internal Affairs: How the Structure of NGOs Transforms Human Rights. By Wong, Wendy H.
Semi-Presidentialism: Subtypes and Democratic Performance. By Elgie, Robert. The Credibility of Transnational NGOs: When Virtue Is Not Enough. Edited by Gourevitch, Peter, Lake, David, and Stein, Janice Gross. Social Protest and Contentious Authoritarianism in China. By Chen Xi. Protest with Chinese Characteristics: Demonstrations, Riots, and Petitions in the Mid-Qing Dynasty. By Hung Ho-Fung. Outlawed: Between Security and Rights in a Bolivian City. By Goldstein, Daniel M.. Living in the Crossfire: Favela Residents, Drug Dealers, and Police Violence in Rio de Janeiro. By Moreira, Alves Maria Helena and Evanson, Philip. Barrio Libre: Criminalizing States and Delinquent Refusals of the New Frontier. By Rosas, Gilberto. Paths Toward the Modern Fiscal State: England, Japan, and China. By He Wenkai. Strings Attached: Untangling the Ethics of Incentives. By Grant, Ruth W..
Making Citizens in Africa: Ethnicity, Gender, and National Identity in Ethiopia. By Smith, Lahra. The Political Economy of Public Sector Governance. By Bertelli, Anthony M.. Thanks to Bill Bishop and others, my post on China’s urbanization and democracy, Urbanization Won’t Drive Chinese Democracy, has had something of a second life. I wanted to take the opportunity then to connect that piece and my other arguments to the recent and excellent special report from The Economist on China’s urbanization. Getting cities right will help China to keep growing fast for years to come. Getting them wrong would be disastrous, bringing worsening inequality (which the World Bank says has approached “Latin American levels”, although Chinese officials insist it has recently been improving), the spread of slums, the acceleration of global climate change (cities consume three-quarters of China’s energy, which comes mainly from coal) and increasing social unrest. At a plenum of the Central Committee in November the party declared that market forces must play a “decisive role”, the strongest support it has ever expressed for the market. This seems all the more stirring after years of vacillation under Mr Xi’s predecessor, Hu Jintao, who retreated from reform in the face of powerful resistance by vested interests, above all local governments, huge state-owned enterprises and, ironically, the new middle class, which would rather not share the fruits of growth with rural migrants. The piece is well researched and presents a sophisticated picture of what is happening on the ground in and around China’s cities. What I think is missing or problematic is the overall frame. Most nondemocratic regimes are replaced not by revolution and democracy but by other dictators. Most nondemocratic regimes lose power to other nondemocracies, not to democracy. The threats that cities pose to nondemocratic regimes manifest themselves through different channels. Large cities bring together huge numbers of people in a shared space. This makes effective collective action more likely and reduces the ability of the regime to understand, observe, and govern the population. These mechanisms connect large cities with the collapse of nondemocratic regimes. Protests and the potential of protests can push a regime to violence, split elites, spark coups, and, yes, foment revolution. Massive cities are difficult to govern and make failures public rather than private affairs, but failure and regime change do not necessarily imply democratization. For this reason, the Chinese regime’s hukou system is “sharpest of all in China’s ‘first-tier’ megacities,” as the report rightly notes. For decades now, the regime has encouraged the development of the West and the country’s interior in an effort to spread urbanization, growth, and wealth outside of a few coastal megacities. I argue that these efforts are in part attempts to separate the perception of China with the perception of Beijing or Shanghai. Developing Xi’an and Kunming and Chongqing and Wuhan provides ballast for the regime should Shenzhen or Shanghai descend into violence. It can point to other successes rather than rely on the first-tier cities serving as the sole symbols for China’s dream. Consider the following potential scenario. The regime attempts to lock in the support of the urban rich by claiming that without the CCP and its hukou policies, the rich urbanites will be overrun by the rural peasants. As such, the rich would have no choice but to support the dictatorship. However, with incentive-based policies that are compatible with democracy—in fact, that are progressive and support the majority poor at the expense of the minority rich and are fundamentally similar to what one might expect under democratic rule—the regime is losing that potential argument and ability to lock in the support of the urban rich. This pattern is not something that is limited to the situation of China and hukou policy. Whenever a nondemocratic regime engages in good policy-making that is consistent with democratic rule and replaces policies that were incompatible with it, then the survival dynamics are unclear. Presumably, good policies improve general support for the regime through greater outcomes and beliefs about its competence, leading to increased assessments of duration. On the other hand, by replacing policies that require dictatorship with policies that do not, the regime might be making democracy and democratization more likely through the back door. Of course, since nondemocratic regimes most often collapse through transitions to other, different dictatorships, perhaps this risk adjustment is not that disconcerting for the regime. The question becomes does the regime believe that it alone possesses the unique ability to provide for stability of this territory while at the same time enacting policies that look more in line with those in democratic regimes. By improving its governance, the current Chinese regime may be biasing China’s future towards democratic rather than authoritarian rule. The general sense, then, that the Chinese regime is likely to end by transition to democracy could be supported not simply by a vague remembrance of modernization theory (where everything good goes up the escalator together, as Stephen Krasner put it recently) but by the very quality and type of policies that the regime is putting forward. The possibility of revolution still appears remote, but the risk of larger-scale social unrest in urban areas is growing. To divert attention from trouble at home, China’s leaders may be tempted to flex their muscles abroad. As it happens, Jessica Weiss of Yale University and I have written a paper (that I have teased before) on subnational variation in anti-Japanese protests during the 2012 crisis. Consistent with my general argument, larger cities are more likely to see such protests even after controlling for a number of other factors. What is also intriguing is that cities with larger migrant populations also were more likely to have protests. One of the big questions in China going forward is the extent to which the regime can address the divisions within society–urban/migrant, rich/poor–while simultaneously stoking anti-other sentiment in its foreign relations. Hypothesis: As [our explanatory variable] increases, [our outcome variable] also increases, all else equal. The way that hypotheses of this sort are tested is by compiling a large data set and examining if in a multivariate framework there exists a positive coefficient on the explanatory variable. If so, then the hypothesis is confirmed (well, the null hypothesis is rejected) and all is right with the world. Those conducting survey or field experiments operate similarly, although there is less concern in those situations about the interaction of other potentially confounding factors as the treatment has been administered randomly to a sample that resembles the non-treated sample (i.e. it is balanced). This is fine. Obviously there are numerous questions where we are trying to establish the direction and magnitude of causal effects of one factor on an outcome of interest, and this methodology tends to produce compelling evidence in support of these kinds of hypotheses. What I would like to suggest, however, is that we do not limit the work of social science to the investigation of average treatment effects. Those interested in pushing randomized controlled trials as the only acceptable methodology appear less concerned on this point. A positive mean effect can result from a consistent positive treatment effect across all individuals or a bimodal treatment effect with a larger share of individuals being effected in one direction than in the other (for a ludicrously outsized example, see the Pax in Serenity). Politics is a complicated domain (as Einstein said) with creative and independent thinking actors that can change over time and respond to similar stimuli in wildly different directions. The singular focus on means can cause us to ignore the variety of responses inside of the distribution from which the mean emerges. For example, Dean Baker has a great post on his Beat the Press blog about the reality of a very low–but positive–inflation rate. The almost total focus on the mean number ignores that in order to produce a number so close to zero implies a broad set of goods where deflation is already in progress. If deflation is terrifying, then a very low overall inflation rate implies not that deflation is not occurring but that the share of the economy in deflation is relatively large. Focusing solely on the meaning of the mean effect can lead us astray when the real story is elsewhere. I am on the record as having doubts about the validity of some official Chinese economic statistics. Provincial level GDP growth rates jump at moments of political turnover in excess of their electricity consumption and after controlling for other economic changes. I argue that data manipulation is the most likely cause of this discrepancy. The WSJ has a story today that could fit into a similar narrative. Two purchasing manager indices (PMIs), one official and one unofficial, come to different snap judgments about the current state of the Chinese economy. Unsurprisingly, the official statistic shows growth and the private index shows contraction. Is this another case of data manipulation? None of the economists asked to interpret the PMIs suggest that data manipulation is going on. However, the indices have known biases that help account for the different takes on the economy. The official state index has a poor track record of capturing trends surrounding the Chinese New Year holiday. Additionally, the purchasing managers that it polls are tilted towards the state sector compared with the real economy and the HSBC and Markit PMI. It is quite possible that state firms are performing better than private firms in the current situation, thus account for the difference. Biases can certainly be one way to manipulate statistical results. One could imagine only sampling air quality in Yuanmingyuan in Beijing with sampling air in the more polluted center of the city. Conducting a city-wide survey by standing at bus stops or outside of churches on Sunday would yield a biased sample. The question is one of intent. If a bias is present because there is an intent to induce a bias in the data, then manipulation is occurring. What about the PMIs? Taking snapshots of the Chinese economy is a difficult task. Perfecting seasonal adjustments takes serious efforts, and this is particularly the case for the Chinese New Year which moves around in time every year. Finding the right mix of firms that represent an unbiased sample of economic players is also hard. To simply assume that the private PMI is better or more honest than the official data because of the possibility of manipulation seems a stretch at this point. If private figures continue to diverge–with the official data consistently painting a rosy picture, then bias likely will have stepped over the line into manipulation. The greatest driver for democracy in China will not come from its dissidents, overseas subversives or bleeding-heart expatriate busybodies. It will come from the Communist Party’s own urbanisation drive. There is little reason to believe this is the case. As I’ve described at length (and Lo notes as well), China’s new urbanization plan is hardly anything radical. Indeed, the policies are carefully crafted to reduce the political pressures on the largest and most significant urban centers while expanding growth in smaller cities in the interior of the country. China reached that crossover point two years ago. Property rights, rule of law and rise of the bourgeois middle class – the basis of Western democracy – became reality for the majority as part of a vast historical process of which urbanisation across Europe was a key part. Beijing has long argued urbanisation will be the engine for economic growth. It must realise it may have even greater political implications. It is certainly possible that China will democratize. If democratization were to happen, individuals living in China’s cities would be involved. Indeed, large cities are dangerous for dictators. Cities can undermine individual nondemocratic regimes but democracy is not guaranteed just because one nondemocratic regime is ousted. Most dictators are replaced by other dictators. The Chinese regime continues to manage urbanization to reduce political threats that might emanate from its cities. To simply rely on the idea that modernization–the lumping together of urbanization, education, industrial specialization, etc–will inevitably cause democracy ignores the fact that history continues and did not end in 1989. This urbanization plan has been crafted to try to separate the different pieces of modernization–to urbanize and develop–without leading to pressures to democratize. Urbanization, even China’s managed urbanization, changes the economic and political situation in the country, and such changes might drive China somewhere different from where it is today. However, to assume democracy is the drive’s destination is a mistake. Scott does not deny that some designs are well-motivated, and he acknowledges that plans can sometimes do a lot of good. He is concerned to show that when a government, with its “thin simplifications” of complicated systems, fails to understand how human beings organize (and disorganize) themselves, its plans are doomed from the start. Scott calls some governments practitioners of “high modernism,” a recipe for many natural and social disasters, including tyranny… Left to itself, this ideology is overconfident but benign. [High modernism] becomes authoritarian when it is conjoined to “an authoritarian state that is willing and able to use the full weight of its coercive power to bring these high-modernist designs into being.” This is especially dangerous when it is linked to “a prostrate civil society that lacks the capacity to resist these plans.” Thus the greatest calamities in Scott’s book involve a weak society that cannot adapt to a government’s plans. Such a characterization leads Ulfelder to two predictions. If Scott is right about these “certain schemes,” though, then two things are liable to happen. 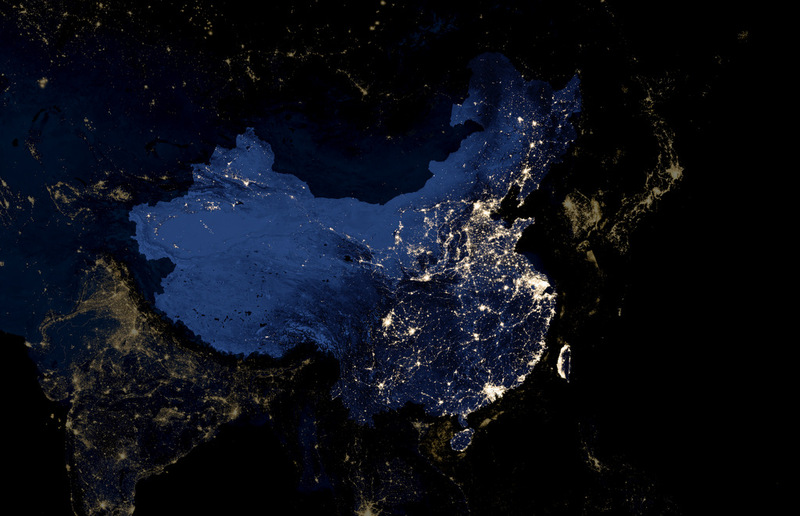 First, China’s new plan for managed urbanization will probably fail on its own terms. It will fail because human planners don’t really understand how these processes work, and even if those planners did understand, they still couldn’t control them. This prediction doesn’t imply that China won’t continue to urbanize, or even that city-dwellers’ quality of life won’t continue to improve on average. It just means that those trends will continue in spite of these grand plans instead of because of them. If the American experience in Afghanistan—or, heck, in its own urban centers—is any guide, we should expect many of the housing developments, schools, and transportation infrastructure born of this plan to go underused and eventually to decay. Or, as an economist might put it, the return on investment will probably be poor. The second prediction of sorts I take from Scott’s book is that the Chinese Communist Party’s plans for socially engineered urbanization will probably produce a lot of conflict and suffering on their way to failure. I disagree with the assessment of the plan as high modernism and with the causal mechanisms underlying the predictions that arise from it. It isn’t high modernist because China doesn’t “plan” like it used to and the described policies incrementally adjust the status quo. The predictions themselves are not wrong so much as they are already correct. If one looks to the evolution in the Chinese terms for planning, we can see that the words have changed first from jihua 计划 and zhilingxing jihua 指令性计划 or “commandist planning” to zhidaoxing jihua 指导性计划 or “guidance planning,” and, more recently, to abandoning the old term jihua completely in favor of guihua 规划, now the commonly used term for what the new National Development and Reform Commission (国家发展和改革委员会), which replaced the old National Planning Commission (国家计划委员会), undertakes. The urbanisation plan was originally expected to be published more than a year ago, but deep divisions between government departments and dissatisfaction from Li Keqiang, the Chinese premier, who has been a strong champion of the scheme, delayed the plan’s publication until now. I would argue that this slowly rolled out plans like this one are less likely to be sweeping than those that emerge out of nowhere. Additionally, this dissatisfaction implies that, unlike in China under Mao, local implementation of the plan is unlikely to be anything but grudging. There is a growing literature on local resistance to implementing central dictates in China (e.g., Margaret Pearson and Mei Ciqi have a nice forthcoming paper in China Journal entitled “Killing the Chicken to Scare the Monkey: Sanctions, Shared Beliefs and Local Defiance in China” that I can’t find online). Second, the document is not a radical departure from prior policy. Johnson’s statement “the plan [is] the country’s first attempt at broadly coordinating one of the greatest migrations in history” fits awkwardly with a history of policies regulating and restricting migration that have existed since 1950s (I might have just finished writing a book about China’s management of urbanization). The household registration (hukou) system was established when Soviet-style industrialization was initiated to control that true high modernist policy’s unintended consequences, namely blind flows of farmers into cities looking for work and escaping rural taxation. This system of effective migration restrictions has been tinkered with at the national and subnational level countless times during China’s post-Mao Reform Era (1978–). Over the past ten years, such reforms have been constantly trumpeted but implemented reality rarely measures up to the hype of policy announcement. Yet reforms have certainly taken place; Tom Miller’s great China’s Urban Billion summarizes many recent changes well. The newly released document describes policies that are broadly similar to what we have seen time after time in recent years: continued “strict control” of population growth in the largest cities and encouragement of development of small and medium-sized cities, particularly in the country’s central and western regions. What is different here is a central commitment to assist local government’s fund the infrastructure of their cities and efforts to contain “land urbanization,” where local governments claim rural land from village collectives, pay farmers a pittance, and sell it at a huge profit to developers. The urbanization of land causes the “forced urbanization” of individuals that Ian Johnson’s reporting decries, so attempts to reduce its prevalence going forward should be welcomed. Why does this plan sound high modernist then? Because it emanates from a Communist Party-led regime that still tends to use language more appropriate to the grand pronouncements of Marxism. It is a Communist state. The regime retains the power to manage the economy and guides it towards in desired directions but in general refrains from stating desired ends. As for the predictions coming from classifying China as high modernist, the country already is dealing with serious problems of ghost cities where any return on investment is questionable. It is certainly possible that aiding the development of small and medium cities will turn out being wasteful economically, even if it might be savvy politically. In terms of urban instability and violence, I’m sanguine. I see this plan as continuing in a long line of policies that the regime has put forward to try to avoid urban unrest–incorporating slums, expanding access to urban social services, and slowing down land confiscations–are all reasonable levers for the center to use to tamp down the possibilities of protest in cities. In the end, the Chinese regime speaks with archaic language–that is indeed, occasionally frightening–but acts like a modern state. Today’s CCP leadership certainly prefers to depoliticize and to quantify, to argue that it is pursuing “development,” “progress,” and “modernization” without giving the Chinese people much of a voice to prevent them from doing so. But so do other modern states. China today is far from the catastrophes of its high modern era, namely the Great Leap Forward. Let us all be thankful that this is so.